None of the other three Games (Pythian, Nemean, Isthmian) ranked in importance with the Olympic Games held every four years. Olympia, the most prestigious of the four centers, became the quadrennial meeting place for the entire Greek world; the preeminent athletic center where sportsmen contended for the most coveted prize of the ancient world—the olive-wreath crown. Olympia was a force that literally unified the Greek world every four years, and exerted a tremendous control on the people. So subtle and strong was its influence that a pilgrimage to Olympia made the visitor a person of importance upon his return home. An Olympic victor was a hero for life. No institution, no event in history has had a longer unbroken record than the Olympic Games, held continuously from 776 B.C. to a.d. 393, nearly twelve centuries. No other human event can equal that record! Women were not allowed to attend the Olympic Games. The only female present was the priestess who presided over the altar of Demeter, Mother Earth. And the eyes of the priestess were closed to the action of the Games as she chanted her prayers. The taboo against female presence at Olympia was strict; it was decreed that should a woman invade the precinct she would be immediately judged and hurled to certain destruction from the high Tymparian Rock into the death gorge below. However on one recorded occasion, officials relented when a woman attended the Games. She was Kallipatera from the island of Rhodes and a member of the Diagoridai family famous for athletic and artistic achievements. She accompanied her son, Peisidorus, to Olympia where he was to compete in the boys' boxing events. Disguising herself as a trainer, the mother stole into Olympia and watched her son win the olive-wreath crown. At his victory, Kallipatera shrieked in a piercing female voice, and thereby unmasked herself. Because Kallipatera was the mother, sister, and daughter of Olympic victors, the officials had no honorable choice but to pardon her. 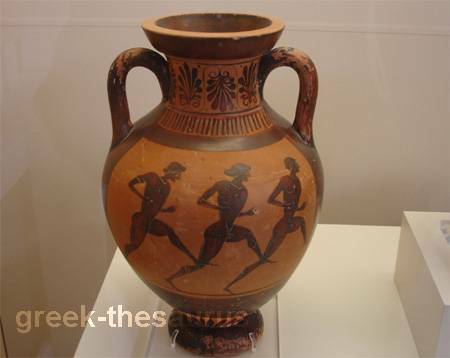 Olympic Games were held in the late summer or early fall after the grain harvest and the olive picking. The exact date was determined by the full moon. According to tradition, the Olympic Games were scheduled for the second or third full moon after the summer solstice, falling either in the month of Apollonius (August) or Parthenos (September) . Due to the movement of the celestial bodies, the Games were held one year in August; the next time, forty-nine or fifty lunar months later, in September. Six months before the Games, the priests and officials at Olympia sent out spondophores, heralds, to proclaim to all men that the Olympic truce was declared, and to announce the fixed dates for the five-day festival. From the time the spondophores began their truce-trek, travelers were under the protection of Almighty Zeus, the Thunderer, and could proceed with safety even through the areas infested with the most villainous robbers. Anyone who broke the truce was accountable to Zeus and to the officials at Olympia, who levied fines against truce breakers. When the spondophores reached a town there was celebration with banquets in honor of the forthcoming Games. When the heralds left, the city engaged in intensive athletic training that mounted as the time approached for the selection of those athletes who would represent the city at Olympia. Knowledgeable judges, appointed by the Boule, watched each day as the fairest and finest young men vied with each other. Finally the day of climax, long awaited, arrived: the judges announced the names of those who would contend at the Olympic Games. Hearts were broken or hearts were warmed, depending on who lost and who won the honor of competing for his city. After their selection, the nominees sacrificed each day to the gods, and intensified their training. Every city selected an Embassy, the official group including political leaders, scholars, artists, musicians, poets, and merchants who would travel to Olympia in splendor as representatives of their city. At Olympia, with the approach of the Games, priests and officials prepared the Hellenodikai, the judges for the Games, putting them through a training period. The Hellenodikai purged themselves of any wrongdoing, and vowed to judge each event on the merits of the individual competitors. The temples were cleaned and, if necessary, repainted. Maintenance crews worked on the stadium, the palaestra, the gymnasium and the hippodrome. Musicians accompanied the workmen who sang as they labored. Pressure mounted. Sacrifices were made every six hours. Excitement increased by the day. The date of the Olympic Games was approaching. About two months before the scheduled Games, depending on the distance to be traveled, the Embassy and athletes of each city departed for Olympia, The night before departure, the city was in festival spirit. Mammoth bonfires burned bright, and the young men of the city danced around the flames. Lambs were roasted for banquets honoring the athletes; sheep were sacrificed to the gods. Revelry continued throughout the night.